The project starts at 8:00 a.m. on the dot at Glen Hills Middle School. The semi truck carrying the load of cement powder rolls in. About half an hour later, the cement powder starts getting laid over the parking lot that has had the asphalt parking lot that was here pulverized. At this point, all that’s left is the pulverized asphalt and gravel bed mixture. Now, every square foot gets an application of cement powder at a depth of around 1.5-2” depending on site conditions the day of work. At 8:55 a.m., the pulverizer starts following behind the cement powder truck. The pulverizer goes 14” into the existing base material, mixing the powder with the existing base material. Once the two are mixed together, the concrete powder starts reacting, hardening the stabilized base components. It is also at this time that the newly mixed stabilized base is tested for the right moisture. To check for this, a ball of the stabilized base is made and it should fall apart after being bounced in a hand. After the powder and existing pulverized asphalt/gravel parking lot have been mixed, the base is rolled and compressed by a pad roller driving over it four times for extra compaction. The grader follows the pad roller and smooths everything out so it is ready for the final compaction from the smooth roller, making it ready for the asphalt installation. 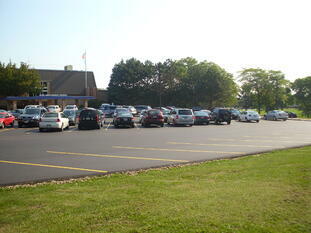 By 4:30 p.m., the base stabilization and grading process for this parking lot is complete. So, what exactly is base stabilization? Stabilizing a base or subgrade is the process in which the existing base material, or even soil, is changed, improving its strength and durability so that asphalt can be paved properly. Stabilization will reduce the plasticity of the base, lower the water content, and increase the strength of the base. Test mixtures should be made to determine the best mixture for a specific project. Base/subgrade stabilization is a cost effective solution for improving problematic soils, such as marshlands or wet and sandy areas. The chemicals used to stabilize base and soil provide an environmental benefit as well. Green house gas emissions are reduced and using less energy intensive materials lowers energy consumption. These benefits tie in with our belief in keeping everything ‘green’ when possible to help protect the environment. A few days later, once the new stabilized base has hardened, the asphalt paving team came in for their turn in the parking lot project. The first layer of asphalt was paved, followed by the surface layer the next day. The new hardened base was able to hold the weight and compaction stresses of the asphalt and its installation, providing a clean, smooth surface of asphalt and a brand new parking lot. Jim Beckmann chose Wolf Paving because of their fair pricing and based on referrals he had received regarding the quality of their work. Is your parking lot in need of base/soil stabilization or new asphalt pavement? Contact Wolf Paving today for more information or to request a quote.